Jura Cycle Clothing - Who was the worst cyclist in the history of the Giro? Home » Blog » Who was the worst cyclist in the history of the Giro? Who was the worst cyclist in the history of the Giro? Malabrocca won the maglia nera, the ‘black jersey’ twice. From 1946 to 1951, the Giro organizers awarded substantial cash prizes to the loser. The maglia nera became almost as desired as the maglia rosa. 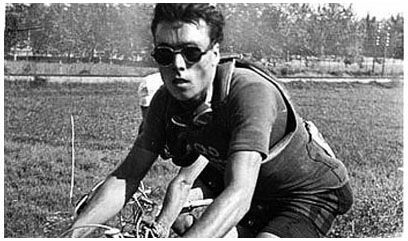 By the 1949 Giro, though, Malabrocca had a serious rival for the black jersey, the Italian rider and ex bricklayer Sante Carollo. The duel was farcical. The racers tried to be as slow as they could, with Malabrocca hiding in a ditch, then in a water tank, finally stopping to eat and drink in a restaurant with some of his supporters during the last stage, with a two hours and twenty minutes delay over Carollo. The jury, however, had had enough: tired of waiting for Malabrocca, they had left before the racer arrived, assigning him the same time of the peloton. Carollo was the winner of a well-deserved maglia nera, finishing almost 10 hours behind race winner Fausto Coppi.